Promoting fetal well-being. By using special techniques and pregnancy pillows, Dr. Malpass allows women and their babies to be safe and comfortable. Controlling pregnancy symptoms. Regular chiropractic care helps women maintain their health during pregnancy, relieve joint, neck and low back pain and control the symptoms of nausea. Restoring poor posture. With the baby’s growth, there are changes in the mother’s body shape like the curve in the lower back increasing and changes to neck and upper back alignment which can cause pain and postural issues. Chiropractors restore proper posture with gentle, specific adjustments. Restoring pelvic balance. When the pelvis is not aligned properly, it can restrict the amount of room the baby has to move known as intrauterine constraint which increases the possibility of breech presentation. The Webster technique, when performed by a chiropractor who is proficient, like Dr. Malpass can switch breech babies to a head-down position 82% of the time without adding any risk to the pregnancy. Reducing labour and delivery time. 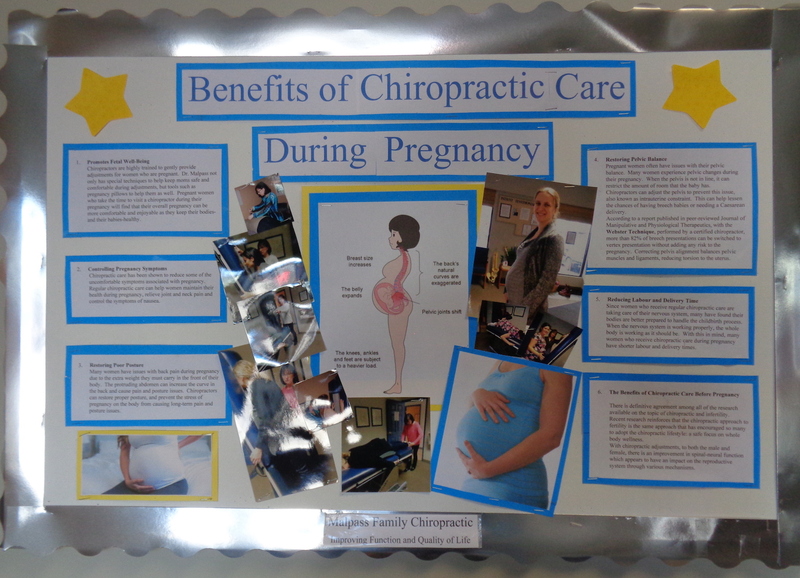 Women receiving chiropractic care are having their nervous system looked after which allows the whole body to be working more efficiently and be better prepared for the childbirth process. Before pregnancy. Chiropractic adjustments to both the male and female improves spinal-neural function which appears to have an impact on the reproductive system through various mechanisms.